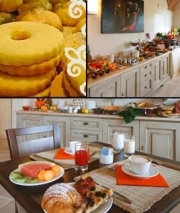 Bed & Breakfast Tarchon is located in close proximity to the centre of Tarquinia and only a few steps away from the sea. Tarchon Bed & breakfast has single, double and triple rooms. The rooms are beautifully furnished with walnut furniture, beaten iron bed frames, Persian carpets and luxurious floor rugs. The majority of the rooms have en-suite bathrooms, which have been decorated with great attention to detail, right down to the top of the range ‘massaging’ showers. A12 to Civitavecchia, S.S. Aurelia to Grosseto, exit after Tarquinia. Starting to Viterbo, Strada Tuscanese to Tuscania, Road SS Tarquiniense to Tarquinia. S.S. Aurelia to Rome, Eexit after Tarquinia.